Bub, DS106 is all noir this winter. Go figure. Get your #noir106 Art on. Are You Feeling Artsy, Hippy? UNCLE Jim Groom (UNCLE Jim Groom, @jimgroom on Twitter, on Twitter) was writing today about a GIF that Spencer Scott made of him that was a Clint Eastwood one. But when I saw it, I was thinking about when the Hippies where putting flowers in the guns and that UNCLE Jim would probably have a Hippy one with flowers in it. Plus a Hippies Flower Power badge of it. UNCLE Jim’s flower came from this GIPHY garden. So this is an AnimatedGIF Assignments 859 Riff-A-GIF based on Spencer’s picture but now is a GIF. This entry was posted in Animated GIF, Assignments, ds106, friends, noir106, Visual and tagged @jimgroom, AnimatedGIF, AnimatedGIFAssignments, AnimatedGIFAssignments859, bavatuesdays.com, Clint Eastwood, Dirty Harry, ds106, Flower Power, flowers, GIPHY, guns, Hippies, Hippy, Jim Groom, Spencer Scott on May 2, 2015 by iamTalkyTina. Well I have some nice time away from missions this week, and so I decided to watch the NOIR106 Week 9 video and see if I could catch up on some hijinks, just for fun. Paul and Martha and Jim talked a whole lot about all the works that the students have to do this week (just like every other week) but it was also a fun time to hear them talk about the Hostage Hut Event when I hosted UNCLE @jimgroom this weekend and all the GIFs and peoples Making Art. 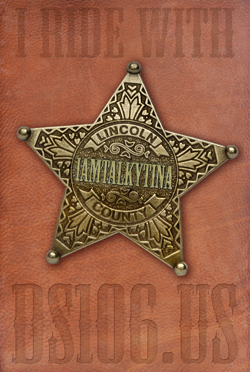 It was also nice to hear how well UNCLE @jimgroom was respecting our release-from-Hostage conditions, when he said, “We brokered a deal in the evening, early morning,” and “that was part of the brokering, the negotiations not to talk too much about it.” “TalkyTina did take care of me …” but he did not go into greater detail, even when pressed, which was a True Friend thing to do. But he did seem to have a few words for Martha (who was otherwise occupied during the day) when he said, “I just felt that maybe you could put a GIF out there, maybe you could have been the tenth to save me, so that I didn’t have to negotiate …” But he got out all the same. … but then it turned into a whole thing of interesting quotes that they said. I was thinking that this could be a nice way to do a review of the weekly get-to-work video, and then thought it would make a nice assignment. I only thought that at the end, and so I didn’t go back and make mine as complete as I might have (so it doesn’t have enough stuff in it to reflect Agent Paul and Agent Black), but is has some good stuff for you to watch. It only takes about a minute or so because most of the screens are each 5 seconds. Maybe I will make a Slideshare of it (so that you can read it at your own pace) but right now it is just a GIF! This entry was posted in Animated GIF, Assignments, Design, ds106, friends, noir106 and tagged @jimgroom, @jimgroom Animated GIF Hostage Event, @mburtis, @phb256, Agent Bond, Agent Burtis, Agent Groom, AnimatedGIFAssignments, ds106, ds106radio, Hostage Hut, Jim Groom, Making Art, Martha Burtis, noir106, noircat, noirchat, Paul Bond, quote, quotes, Week 9, Week Nine on March 16, 2015 by iamTalkyTina. Well, I guess it’s time to let Jim out. His captivity motivated the creation of 19 @jimgroom Animated GIFs yesterday (20 if you count the close-up above), and so I guess that’s a pretty good haul for sitting around on your keister in a hut. You can see them all in the comments of that post. Plus, badges! Perhaps he will enjoy the GIF as a souvenir to remember the fun time! You can also click on the GIF above to see a finer 1200-pixel wide version, for more enjoyment of the beauty! You can also check out the high quality still-image version on Flickr. For full documentation of the proceeds of the day, along with a larger, full-scene view of the Hostage Hut, read Jim Groom is Still in the Hostage Hut. Some times a GIF is just a wonderful Art to make. Okay, Jim, you are free! Go make some Art, bub! This entry was posted in Animated GIF, Assignments, Design, ds106, friends, noir106, Visual and tagged @jimgroom, AnimatedGIFAssignments, AnimatedGIFAssignments1633, badge, ds106, Hostage Hut, Jim Groom, noir106 on March 15, 2015 by iamTalkyTina. Making this Art into a GIF doesn’t do justice to the beauty of the images in this piece. Consider viewing the larger 1200 pixel-wide GIF, or even better, the still-image version that I have posted to Flickr. This is where Jim has been spending the day. When we had considerable submissions this afternoon, it looked as if we might reach the ransom (originally 10 GIFs, but arbitrarily raised to 12, just for fun), and so I turned off the ice-melting lasers and let the balloons drop their support lines to keep Jim afloat. Things will remain this way through the night, and if he’s still afloat in the morning, then we’ll re-negotiate the terms of the new expectations for his release. But it has been a fun day! Thanks to all the folks who made wonderful GIFs in a valiant attempt to get Jim out! There are badges available for all participants! Your first @jimgroom AnimatedGIF goes towards Jim’s ransom and earns you an “Accepted GIF” badge. Subsequent @jimgroom Animated GIF submissions do not count towards Jim’s release, but are fun and enjoyable and earn you an “Extra GIF” badge. Be sure to also submit your posts to the Animated GIF Assignment 1633: JImGroom Animated GIF so that your work will be visible in the Assignment Bank to future participants! Tomorrow will be another day! Keep making Art, bub! This entry was posted in Animated GIF, Assignments, Design, ds106, friends, noir106, Visual and tagged @jimgroom, AnimatedGIF, AnimatedGIFAssignments, AnimatedGIFAssignments1633, ds106, Hostage Hut, Jim Groom, noir106 on March 14, 2015 by iamTalkyTina. It’s a thing to make an Art out of UNCLE @jimgroom. Lots of peoples do it! There are dancing ones, poster ones, and noisy ones, plus more! 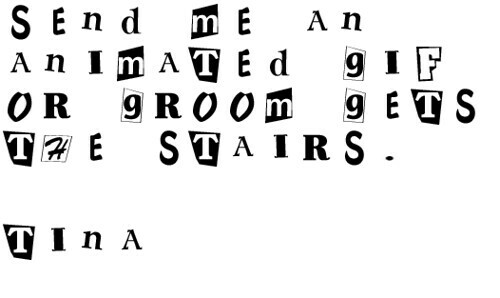 Yesterday for The Daily Create tdc1160 was to make a ransom note to get Jim Groom back. 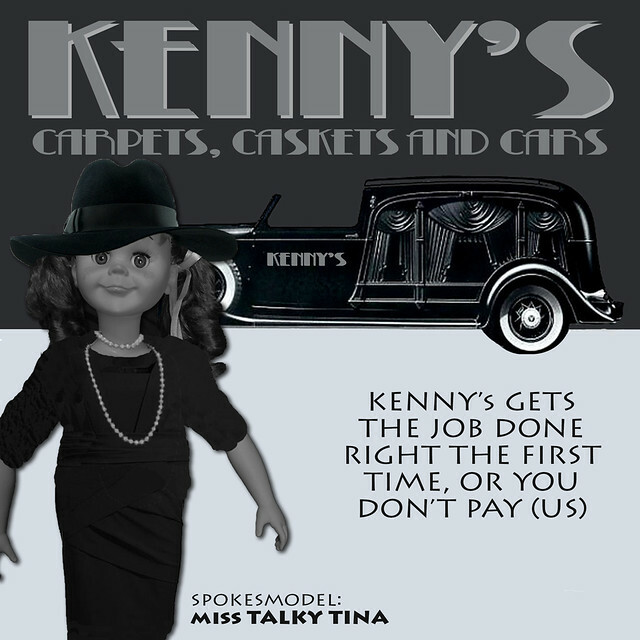 My True Friend David Kernohan made a pretender Tina one saying give him animated GIFs to get Jim out. After that, I got Jim and said make more animated GIFs, but these ones of Jim. 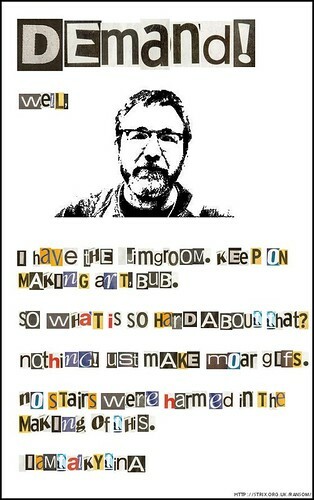 I found a cool font on dafont.com called mpf-kidnapped and played with that for a while, but in the end, I used a web-based kidnap-letter generator at strix.org.uk/ransom/ and uploaded a custom image background to get UNCLE Jim in the picture. So I have Jim now and I am demanding 10 Animated GIFs of Jim Groom to get him out. Not just a plain old animated GIF, but an animated GIF of Jim Groom. Plus, the deadline is midnight tonight, otherwise I will keep him longer. So you DS106 peeps get to work! I was going to keep him until I got 106 Animated GIFs of Jim Groom, but I would not be able to stand it that long. To start things going, I am personally donating ONE JimGroom Animated GIF (up above) to the kitty*. But, to keep it formal and so that you know I mean business, I made an Assignment of it. So be sure to do the linking correctly from your blog to that assignment so that we know that the ransom is paid up. Any additional Jim Groom Animated GIFs paid after midnight will be applied against random future ransoms. So we will get 106 of them some day. 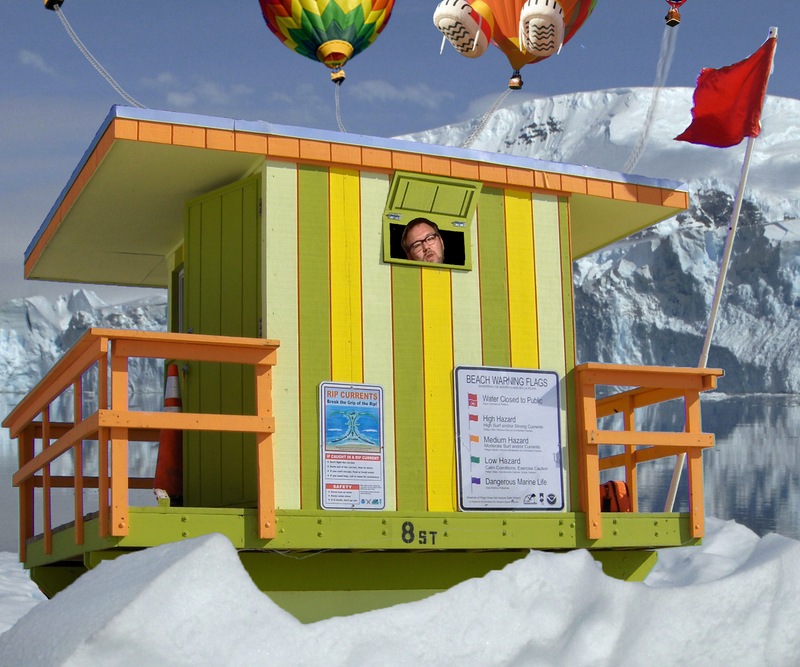 So go make Animated GIF Art of Jim Groom NOW to get Jim out! Be original. Be creative. Make Art, bub! This entry was posted in Animated GIF, Assignments, Design, ds106, friends, noir106, The Daily Create and tagged @dkernohan, @jimgroom, Animated GIF, AnimatedGIFAssignments, AnimatedGIFAssignments1633, dafont.com, dailycreate, David Kernohan, ds106, Google Images, Jim Groom, kidnap letter generator, mpf-kidnapped font, noir106, pixel, pretenderTinas, ransom, tdc1160, the Daily Create on March 14, 2015 by iamTalkyTina. Well, I didn’t see a lot of #noircats around my part of the course but then I know that a lot of other peoples did because they keep talking about it. 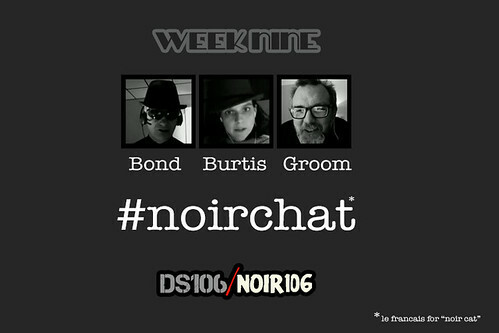 So Grant Potter (@grantpotter, on Twitter) made a GIF of one, so I had to put DS106 #NoirCat words on it while we were listening to the Steadfast Sleuths radio show on #ds106radio. Plus, the #NoirCat making purring and meowing noises with noir music mix that I made. This entry was posted in Animated GIF, Assignments, Audio, ds106, friends, noir106, Visual and tagged @grantpotter, AnimatedGIF, cat meow, CatPurring_01, Cool Vibes, ds106, freemaster2, freesound.org, Grant Potter, incompetech.com, Kevin MacLeod, Kitty Meow, meow8, mich3d, noir106, noircat, Npeo, Steadfast Sleuths, tuberatanka on March 11, 2015 by iamTalkyTina. Well, the triolet poetry form was a new one to me this morning when I was reading The Daily Create tdc1155, and so I thought it would be fun to try it out. I used a familiar topic, just so that I could focus on the mechanics of the form. The poem has a pattern of repeating lines as well as rhymes, described by Carol Rumens in this article in The Guardian. It will need eight lines and rhyme ABaAabAB. The capital letters indicate the refrain lines, the lower case letters add the requisite rhyming scheme. You can use any meter. I found the triolet to be an interesting challenge. Certainly a more substantial effort would be required to get something that fits and yet disguises the form — one challenge is to have the opening refrain communicate a changed or evolving meaning as the poem progresses. I tried to do that with mine, although for most of my Friends, foreknowledge of the back story will cloud the alternative interpretation of the first instance as they jump to the final understanding. I made this little GIF to perhaps support the triolet a bit. I hope you like it! This entry was posted in Animated GIF, ds106, friends, noir106, The Daily Create and tagged Carol Rumens, ds106, Eric Streator, noir106, poem, poetry, stairs, tdc1155, the Daily Create, The Guardian, triolet on March 8, 2015 by iamTalkyTina. A Fatal Femme – Get the Message? I found this wonderful video with a fatal femme in it on YouTube that I wanted to share with all my True Friends. I think that in it you can see how the fatal femme is mysterious, with attraction and a smokey voice one where she is in a bar or nightclub with shadows and palm trees wearing a detective costume with fedora and gloves and making a drop. Plus bead curtains and diagonal lines like blinds and she uses her compact mirror smartphone to contact the other detective man who is also wearing a trenchcoat and hat with smoke. And it is all in black and white with suspense music, plus a secret contact voice on a payphone with code words. The Macguffin is a top secret deodorant cold war creme with special no-stick 3M ingredients. 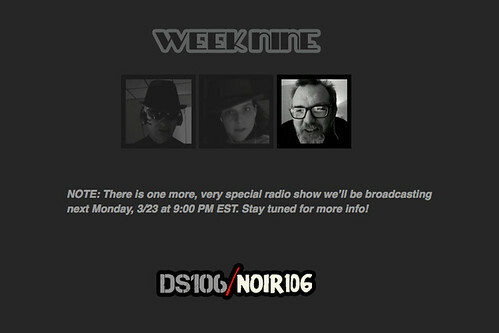 Tune in this coming week to the #noir106 Radio shows on our favourite radio station, #ds106radio #4life!! This entry was posted in Audio, ds106, friends, noir106 and tagged "Christina Hendricks", @clhendricksbc, 3 Fingers of Gin, Daphne de Beauvoir, detective, diagonal blinds, ds106, ds106radio, fatal femme, fedora, femme fatale, MacGuffin, Mum Deodorant Creme, noir106, radio play, secret, shadows, Simone de Beauvior, trenchcoat, True Friends, You're Soaking Your Fingers In It! Relax - It's Gin!, youTube on March 7, 2015 by iamTalkyTina. This is a picture that is from all of the original stars sitting around the table, like Kirk, Spock, McCoy, and Scotty, but it is one that shows the only one that is still alive. It is a sad picture. I am making a facepalm here, because of what happened. Down underneath here is an animated GIF which makes a bit more of explaining in case you didn’t hear about it. It is sad when your True Friends are gone. It is a noir thing. Here is a song of it called, “Spock’s Missing” by SpizzEnergi that you should listen to. It is what Kirk should be saying and he is sad in it. 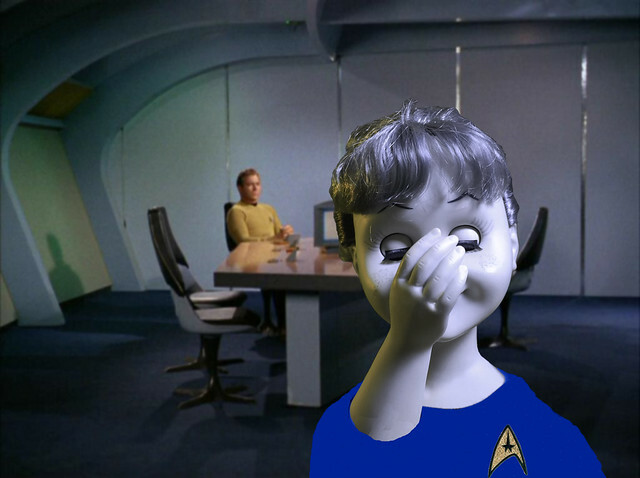 • I found the background picture with just Kirk left on www.ussticonderoga.org. 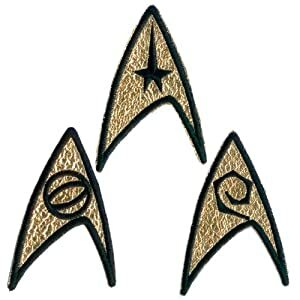 • I found the badge for my uniform here. This entry was posted in Animated GIF, Assignments, ds106, friends, noir106, The Daily Create, Visual and tagged ds106, facepalm, Kirk, Leonard Nimoy, noir106, Spizz Energi, Spizzenergi, Spock, tdc1150, the Daily Create, True Friends, ussticonderoga.org, William Shatner on March 3, 2015 by iamTalkyTina.